Global demand for timber, agricultural commodities, and extractives is a significant driver of deforestation worldwide. Transparent land-concessions data for these large-scale commercial activities are essential to understand drivers of forest loss, monitor environmental impacts of ongoing activities, and ensure efficient and sustainable allocation of land. However, most countries lack comprehensive datasets on the precise location, extent, and ownership of land concessions, making it difficult to accurately understand how forest resources are being exploited, identify overlapping land uses, and monitor company activity. This working paper gives an overview of the availability of information for land concessions in 14 forested countries (Brazil, Canada, Cambodia, Colombia, Indonesia, Liberia, Madagascar, Malaysia, Mexico, Myanmar, Papua New Guinea, Peru, Republic of the Congo, and Russia), with a special focus on open spatial information. This paper examines the existence of laws governing the disclosure of concessions data and assesses the completeness and quality of concessions data across countries and sectors, as reported by a network of in-country researchers. Global demand for timber, agricultural commodities, and extractives is a significant driver of deforestation worldwide. The majority of the world’s forests are owned by governments, which often enter into contractual agreements with private companies or individuals for resource exploitation or conversion in a specific area for a predetermined amount of time. 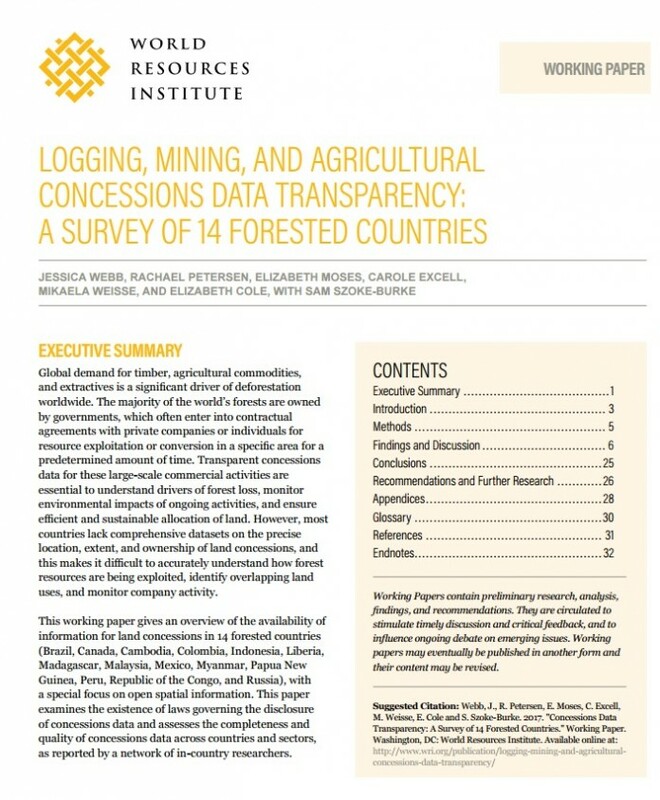 Transparent concessions data for these large-scale commercial activities are essential to understand drivers of forest loss, monitor environmental impacts of ongoing activities, and ensure efficient and sustainable allocation of land. However, most countries lack comprehensive datasets on the precise location, extent, and ownership of land concessions, and this makes it difficult to accurately understand how forest resources are being exploited, identify overlapping land uses, and monitor company activity. This working paper gives an overview of the availability of information for land concessions in 14 forested countries (Brazil, Canada, Cambodia, Colombia, Indonesia, Liberia, Madagascar, Malaysia, Mexico, Myanmar, Papua New Guinea, Peru, Republic of the Congo, and Russia), with a special focus on open spatial information. This paper examines the existence of laws governing the disclosure of concessions data and assesses the completeness and quality of concessions data across countries and sectors, as reported by a network of in-country researchers. The level of concessions data disclosure varies significantly by country and sector. For example, while comprehensive spatial data are available in the Republic of Congo and Canada, Myanmar, Madagascar, and Russia provide only limited access. In addition, concessions data were generally more accessible for mining than for logging or industrial agriculture. Civil society can be a significant source of concessions information where official data are unavailable. Despite the fact that concessions data are essential for participatory and equitable land-use planning, very few governments in this study proactively provide concessions data in a way that meets open data standards (e.g., available for download, use, reuse, and redistribution). Civil society, such as activist or research organizations, plays a role in complementing or compensating for a lack of official government data often through ad hoc means, such as digitizing paper documents, compiling leaked information, and publishing the resulting datasets to the public via independent Web portals. Governments with Freedom of Information (FOI) laws tend to provide information more proactively than countries without these laws; however, challenges with data access and quality remain. Many in-country researchers participating in this study successfully obtained at least partial concessions data (e.g., not geographically comprehensive) through information requests; however, the existence of FOI laws did not necessarily guarantee access to data. When formal FOI requests failed, researchers pointed to lack of cooperation among government ministries or a lack of awareness about information request procedures as barriers to accessing information through these means. There is no consistent relationship between participation in voluntary partnerships or guidelines related to agriculture, logging and mining concessions transparency, and proactive concessions data release. Although participation in partnerships did seem to correlate moderately with increased proactive data disclosure, these partnerships were not drivers of disclosure in all cases. This is in spite of the fact that some partnerships, such as the Extractive Industries Transparency Initiative (EITI), specifically encourage the release of contractual agreements, licenses, and accompanying spatial data, which calls into question the effectiveness of such partnerships in achieving transparency goals. No internationally agreed upon standard exists for the release of logging, mining, or agriculture concessions data. Even where governments proactively release information on concessions, data quality issues remain. Some governments in this study released concessions data to the public. However, researchers often reported that data were out of date, incomplete, or inaccurate. Attribute and metadata vary widely and could benefit from international guidelines or standards that outline best practice. The availability of digital spatial data and the laws pertaining to access to that information change rapidly. Many of the links to laws and data that researchers provided were broken or offline only a few months after the study concluded; in other cases, government and civil society published new information portals during the same time period. The acquisition of concessions data is a time- and labor-intensive process. This paper concludes with specific recommendations for policymakers, donors, civil society organizations, and other stakeholders for improving the transparency and disclosure of concessions information. The paper also suggests areas for further research, including the enabling conditions and barriers to land concessions transparency. • Iniciativa de Acceso a la Información TAI. • Coalición Regional por la Transparencia y la Participación. •	Grupo de financiamiento climático para América Latina y el Caribe – GFLAC. • Alianza Mundial por el Derecho Ambiental – ELAW. •	IFIS en la Mira.